Any angler taking to the water relies heavily on the trolling motor. This piece of equipment — whether mounted to your one-person watercraft, a 15-foot Jon boat or your bass boat — is essential to fishing. A trolling motor has to be reliable, the battery has to hold a charge, and it must be easy to manipulate for it to be useful at any position on the boat, but especially as a bow mount, where the trolling motor is going to need to provide you with fine and quick directional control as it pulls your boat along. 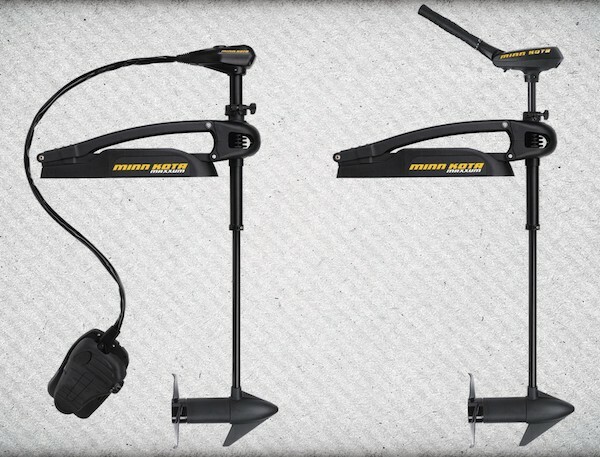 In this review, we are going to take a look at the Minn Kota Maxxum bow mounting trolling motor. We will take a look at the features of this trolling motor as well as how those features translate to performance on the water from our experience and according to the experts. From our research, we here at Fishing Tech give the Minn Kota Maxxum an A rating. The mounting bracket for the Minn Kota Maxxum trolling motor is made from a durable aluminum and high-strength steel and when mounted onto your boat properly will keep your motor secure. The Bowguard mounting technology used with the Maxxum acts as a shield for the bow of your boat as well as providing pressure relief to the shaft and motor in the off chance that you impact heavy bottom structure. The directional indicator is available on foot control models and allows you to quickly identify which direction your motor will take you when power is applied. For just getting on the water or near the end of the day, the push-to-test function of the Maxxum hand models make it easy and quick to tell how much run time you have remaining. The composite shaft used for the Maxxum motors is incredibly strong and will resist warping and breaking under extreme pressure. This shaft is extremely flexible compared to other materials and comes with a lifetime warranty. The two blade prop used on all Maxxum models uses a flared and swept back blade design for working through thick vegetation. There are three different speed control options for the Maxxum trolling motor models. There is the Digital Maximizer (Variable), 5-speed, and 5fwd/3rev speed settings. Not all models are available with a choice of the three different speed control options as we will outline in the model breakdown below. Minn Kota offers several accessories that can be bought separately from the motor as well as several replacement parts. The Maxxum is available in several model options that share most of the major features of the product, including the tournament-tested mount, Bowguard 360 degree technology, Weedless Wedge 2 Prop, indestructible composite shaft, and a 2-year warranty. Only the foot control models have the illuminated direction indicator, and only the hand control models feature the push-to-test battery meter. The models also differ in several metrics such as the control position (foot or hand), thrust output, required voltage, shaft length, and the type of speed control. The Minn Kota Maxxum mount provides a secure base for your motor in the case of running into stumps or other obstacles in the field, but it also locks the motor in securely when not in use and on the ride from the lake to the garage which can be equally dangerous for your motor. A strong and unyielding base can sometimes be problematic. The coil-based Bowguard protection system found on all the Maxxum motors provides extra security that in case of impact and will allow the motor to break away, relieving pressure on the shaft and reset automatically. The main shaft used on all of the Maxxum models is a composite material that is far more flexible than steel, which for trolling motors is as important than pure strength, and it is resistant to corrosion and warping. Upon impact, the shaft will flex, relieving pressure that would otherwise warp or even break the motor shaft. It’s not indestructible, but incredibly resistant to outside forces places on it. The shaft along with the Bowguard give you some comfort when working around cluttered areas of water, often where the big fish are lurking. Finally, there is the Weedless Wedge 2 Prop used on all of the Maxxum models. The design of this prop uses flared and swept back blades. Rather than generating a lot of torque and using up more power to cut through vegetation with brute force, this blade design is used to flow through vegetation. This design also helps conserve battery life and gives you more time on the water. While the foot control models give you a hands-free approach to running the motor, they do have more of a learning curve when it comes to commanding of the boat. All of the models also come in a hand control models, but you lose the ability to fish and control the boat at the same time. Whichever model you go with, both the hand and foot control models are extremely sensitive and give you very fine control over the motor direction. The foot control has a rotary speed control as well as a switch for constant, momentary, and off settings. It comes with a 5ft cable so you can position the foot control where it is needed. While the foot control is sensitive, the major complaints from reviews found at major retail stores such as Cabela's and Bass Pro are that the rotary speed control rheostat tends to burn out and the faceplate becomes loose over time. This is a common occurrence in foot control plates and not a drawback to this specific model. With the limited two year warranty, you should be able to have the issue fixed. The hand control models have a tilting and telescopic tiller (45-degree tilt and 6-inch extension) that allows you to get the right position for the most comfortable handling. It also features a steering tension adjustment knob that is easy to use and secures your settings. If you like hand controlled trolling motors, which are great for boats sitting low in the water, we didn't find any issues with the Maxxum's handle. We also like the shaft which can be adjusted to get your motor lower in the water. With this, you can reduce cavitation and give you a much quieter and much smoother performance. While it is difficult to review how the thrust of the various models will work on your particular water vessel, the Maxxum models come in a variety of thrust (lb) options. If you understand the size and weight of your boat, you can match up the amount of thrust you will need to adequately pull your boat around. A rule of thumb for calculating how much thrust you will need for peak performance is to make sure you have 2lbs of thrust for every 100lbs of boat. So, if you have a 2,000lb boat, your minimum thrust should be 40lbs. If you fish choppier waters or water that has stronger currents, you will need to go up in thrust. With 55, 70, and 80lb thrust options from the Maxxum, there is a Maxxum available that is going to have more than enough thrust for your drift boat, Jon boat, or small to medium sized fishing boat. With a deep cycling battery, you are going to get a full day's worth of action from these trolling motors unless you are running full power constantly. If you are not fully confident in your battery, the hand control models have a push-to-test LED light display which gives you an accurate measurement of remaining battery power when the motor is turned off. This is an incredibly useful feature for a trolling motor. Models of the Maxxum featuring the Variable speed control (Digital Maximizer) which optimizes the amount of draw on the battery giving you the exact measure of current you need to run the motor at a given speed. This greatly extends the battery life and overall run time of your motor. The Edge is a bit smaller than the Minn Kota Maxxum with thrust options ranging from 45 to 70lbs of thrust. It is also available in hand and foot control models. It shares a lot of the same features of the Maxxum including a directional indicator on foot control models, 5speed and 5/3 speed control options, composite shaft, and a Weedless Wedge 2 Prop. It also has the option for a Power Prop Propeller. It does not have the battery test options, Bowgaurd technology, Maxxum mount, or the Digital Maximizer speed control. The Fortex line from Minn Kota offers trolling motors which much more thrust with hand and foot control options in 80 and 112lb thrust options. These trolling motors offer a much more advanced mounting and system with lift assist and counter tension stabilizers. It has all the features of the Maxxum along with a removable Bowgaurd and built-in transducer for sonar capabilities. MotorGuide is another top brand of trolling motors, and their X3 model is very similar to the Maxxum in features. There are both hand and foot control options available for the X3 and quite a few more model options for thrust (45-70lbs), shaft lengths, and speed control options which include variable, five speed, and 5fwd/2rev options. Perhaps the biggest difference is that the X3 also comes in saltwater options while the Maxxum does not. The Minn Kota Maxxum is a great medium sized trolling motor that comes in a variety of models to suit your style of boat and style of trolling motor control. It’s a great balance for those not wanting to completely blow their paycheck but still have a powerful motor to guide them around the lake. When it comes to a trolling motor, you want durability, working and applicable features, and a motor that will run for hours. The Maxxum has all of this and is the reason it deserves the A rating.